Look up at the night sky and you'll see stars, sure. But you're also seeing planets – billions and billions of them. At least. That's the conclusion of a new study by astronomers at the California Institute of Technology (Caltech) that provides yet more evidence that planetary systems are the cosmic norm. The team made their estimate while analysing planets orbiting a star called Kepler-32 — planets that are representative, they say, of the vast majority in the galaxy and thus serve as a perfect case study for understanding how most planets form. "It's a staggering number, if you think about it," adds Jonathan Swift, a postdoc at Caltech and lead author of the paper. "Basically there's one of these planets per star." 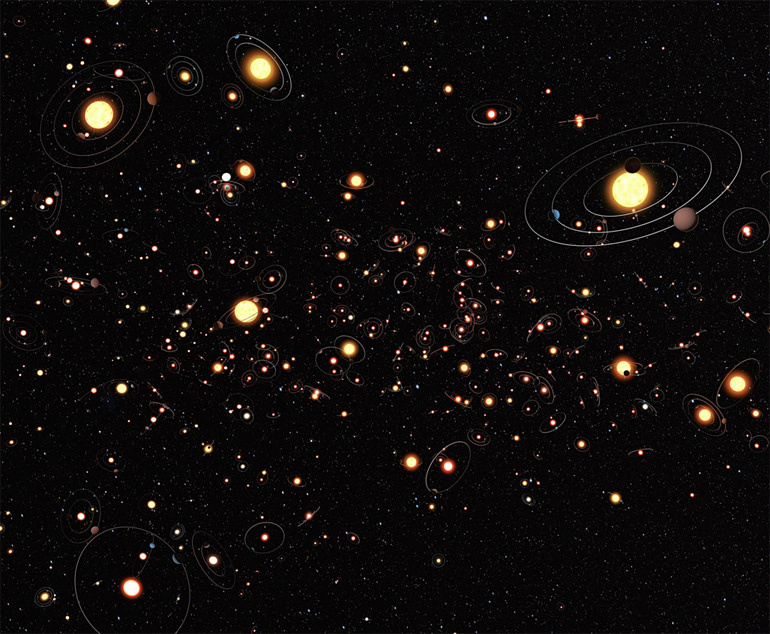 The planetary system in question, which was detected by the Kepler space telescope, contains five planets. The existence of two of those planets have already been confirmed by other astronomers. 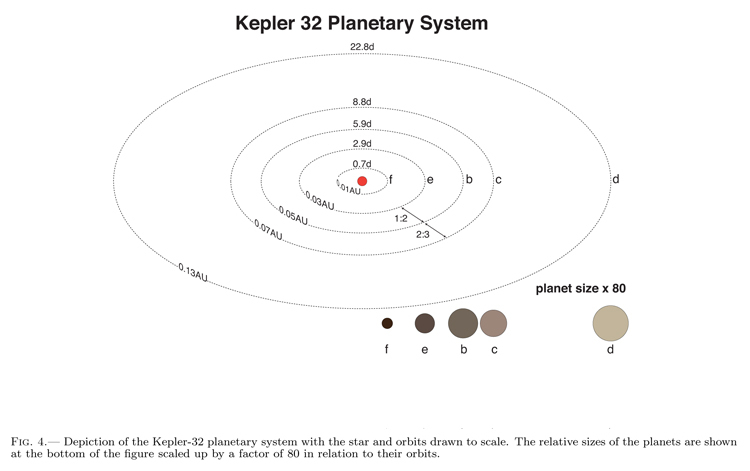 The Caltech team confirmed the remaining three, then analysed the five-planet system and compared it to other systems found by the Kepler mission. While this particular system may not be unique, what does set it apart is its coincidental orientation: the orbits of the planets lie in a plane that's positioned such that Kepler views the system edge-on. Due to this rare orientation, each planet blocks Kepler-32's starlight as it passes between the star and the Kepler telescope. By analysing changes in the star's brightness, the astronomers were able to determine the planets' characteristics, such as their sizes and orbital periods. This orientation therefore provides an opportunity to study the system in great detail — and because the planets represent the vast majority of planets that are thought to populate the galaxy, the team says, the system also can help astronomers better understand planet formation in general. "I usually try not to call things 'Rosetta stones,' but this is as close to a Rosetta stone as anything I've seen," Johnson says. "It's like unlocking a language that we're trying to understand — the language of planet formation." To do that calculation, the Caltech team determined the probability that an M-dwarf system would provide Kepler-32's edge-on orientation. 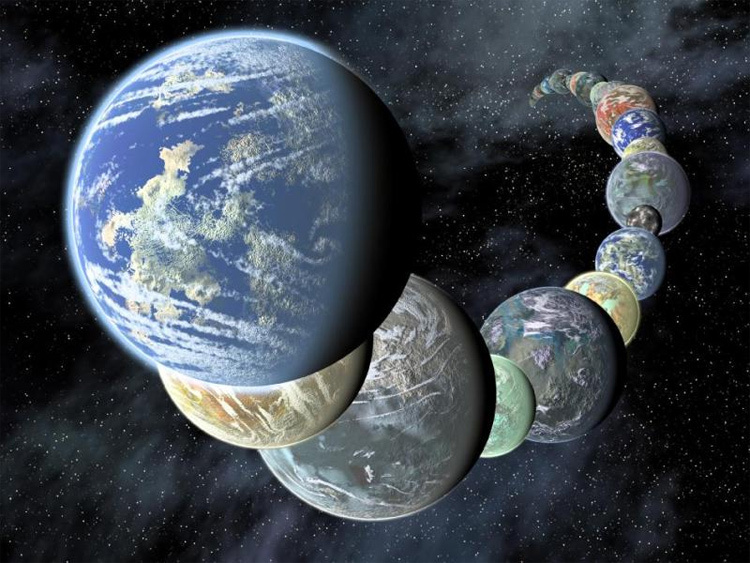 Combining that probability with the number of planetary systems Kepler is able to detect, the astronomers calculated that there is, on average, one planet for every one of the approximately 100 billion stars in the galaxy. But their analysis only considers planets that are in close orbits around M dwarfs — not the outer planets, or those orbiting other kinds of stars. As a result, they say, their estimate is conservative. In fact, says Swift, a more accurate estimate that includes data from other analyses could lead to an average of two planets per star. M-dwarf systems like Kepler-32's are quite different from our own solar system. For one, M dwarfs are cooler and much smaller than the sun. Kepler-32, for example, has half the mass of the sun and half its radius. The radii of its five planets range from 0.8 to 2.7 times that of Earth, and those planets orbit extremely close to their star. The whole system fits within just over a tenth of an astronomical unit (the average distance between Earth and the sun) — a distance that is about a third of the radius of Mercury's orbit around the sun. The fact that M-dwarf systems vastly outnumber other kinds of systems carries a profound implication, according to Johnson, which is that our Solar System is extremely rare. "It's just a weirdo," he says. The fact that the planets in M-dwarf systems are so close to their stars doesn't necessarily mean that they're fiery, hellish worlds unsuitable for life, the astronomers say. Indeed, because M dwarfs are small and cool, their temperate zone — also known as the "habitable zone," the region where liquid water might exist — is also further inward. Even though only the outermost of Kepler-32's five planets lies in its temperate zone, many other M dwarf systems have more planets that sit right in their temperate zones. As for how the Kepler-32 system formed, no one knows for sure yet. But the team says its analysis places constraints on possible mechanisms. For example, the results suggest that the planets all formed farther away from the star than they are now, and migrated inward over time. Like all planets, the ones around Kepler-32 formed from a proto-planetary disk — a disk of dust and gas that clumped up into planets around the star. The astronomers estimated that the mass of the disk within the region of the five planets was about as much as that of three Jupiters. But other studies of proto-planetary disks have shown that three Jupiter masses can't be squeezed into such a tiny area so close to a star, suggesting to the Caltech team that the planets around Kepler-32 initially formed farther out. Another line of evidence relates to the fact that M dwarfs shine brighter and hotter when they are young, when planets would be forming. Kepler-32 would have been too hot for dust — a key planet-building ingredient — to even exist in such close proximity to the star. Previously, other astronomers had determined that the third and fourth planets from the star are not very dense, meaning that they are likely made of volatile compounds such as carbon dioxide, methane, or other ices and gases, the Caltech team says. However, those volatile compounds could not have existed in the hotter zones close to the star. Finally, the Caltech astronomers discovered that three of the planets have orbits that are related to one another in a very specific way. One planet's orbital period lasts twice as long as another's, and the third planet's lasts three times as long as the latter's. Planets don't fall into this kind of arrangement immediately upon forming, Johnson says. Instead, the planets must have started their orbits farther away from the star before moving inward over time and settling into their current configuration. "You look in detail at the architecture of this very special planetary system, and you're forced into saying these planets formed farther out and moved in," Johnson explains. 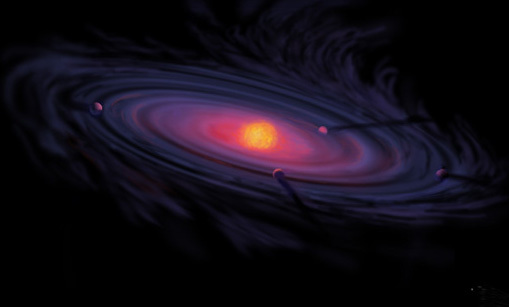 The implications of a galaxy chock full of planets are far-reaching, the researchers say. "It's really fundamental from an origins standpoint," says Swift, who notes that because M dwarfs shine mainly in infrared light, the stars are invisible to the naked eye. 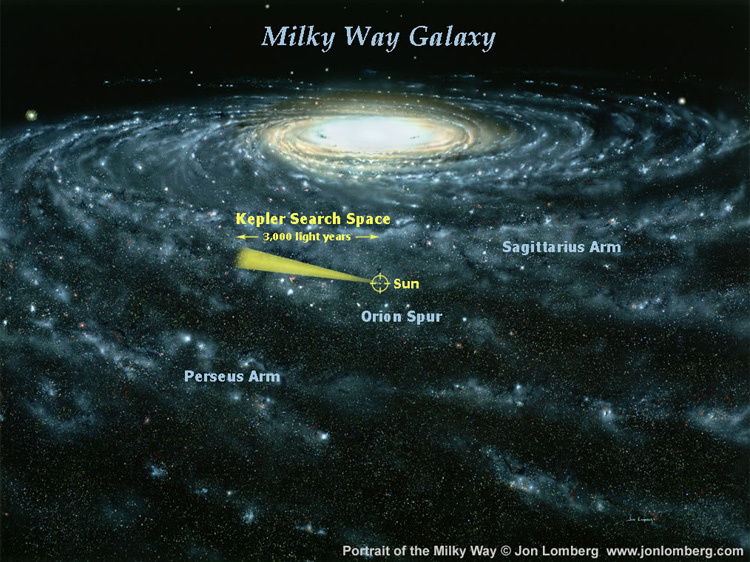 "Kepler has enabled us to look up at the sky and know that there are more planets out there than stars we can see."